Many electric razors nowadays are waterproof and can work both in and out of the shower. This wet/dry feature is extremely convenient for men who are always on the go. 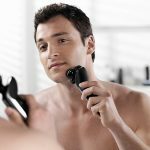 Whether you like wet or dry shaving, you should find at least one electric shaver on this list to suit your needs. In this article, we'll take a look at a few highly reviewed products. 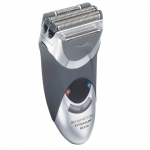 Users considered these selections as their best wet dry electric razor on the market. All of the products listed below have been arranged from the most affordable to the most expensive. RUNWE's Wet/Dry Electric Shaver is the most affordable razor on our list. You'll only have to pay $17 to experience the RUNWE Electric Shaver for yourself. This black shaver measures 2.2 x 2.2 x 5.9 inches and weighs 4.5 ounces. 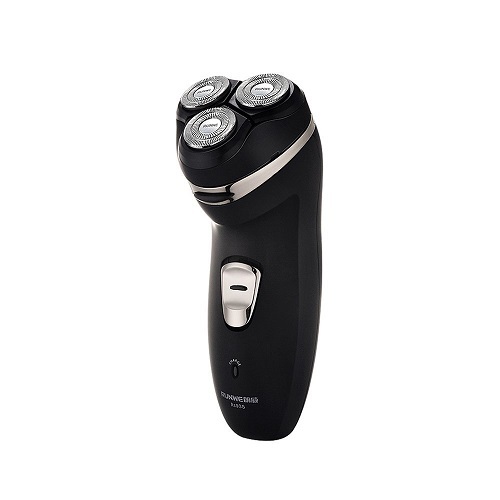 Each RUNWE Electric Razor has 3 shaving heads that move in four directions. There's also a convenient trimmer built into this shaver. One feature some reviewers don't like about the RUNWE Electric Shaver is the long charging time. It takes about 8 hours to charge this battery for 50 minutes of use. Out of almost 45 customer reviews, the RUNWE Electric Razor has a score of 3.5 stars. 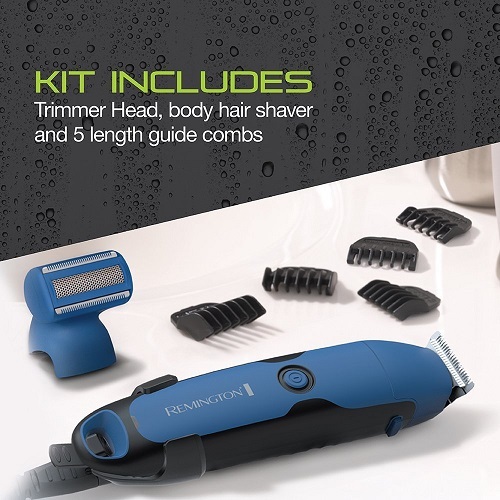 While it might not have all the fancy features of some other products on this list, anyone looking for the best wet dry electric razor for the price has to take a deeper look at RUNWE's Electric Shaver. The next best wet dry electric razor we'll take a look at is ELEHOT's Electric Razor. 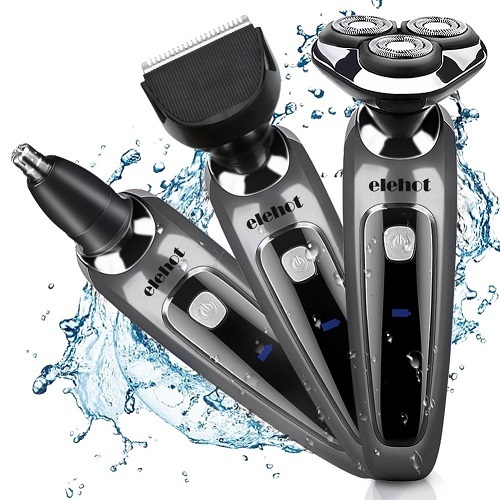 Each ELEHOT Electric Razor comes with 5 attachments which include a nose hair trimmer and two hair clipper combs. The 3 shaving heads on this device move in 4 directions. They are designed to move with flexibility across your face and neck. 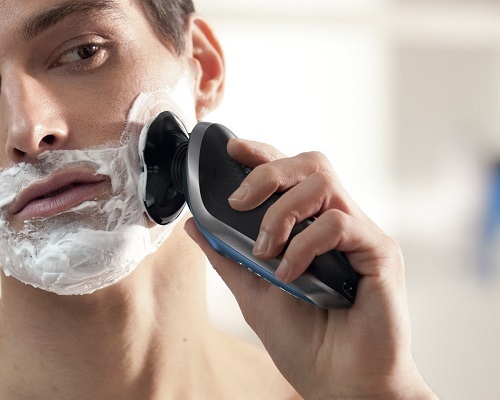 This shaver's lithium-ion battery takes only 1.5 hours to charge and lasts for 45 minutes. Out of nearly 200 online reviews, the ELEHOT Electric Shaver has an impressive 4.5-star rating. You can pick up the ELEHOT Electric Shaver for $22. The third best wet dry razor on our list is from a more familiar company name: Remington. Specifically, the model we're looking at is called the Remington PG6250. 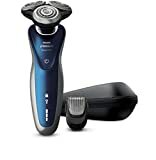 This is one of the more affordable name brand wet dry electric razors at only $39 a pop. One interesting feature of the Remington PG6250 is its blue and black design. There's a convenient LED display on each of these razors. This will let you know how much battery life you have left. Speaking of battery life, each Remington PG6250 has a lithium-ion battery that fully charges in about 3 hours for 75 minutes of usage. There's also a "Quick Charge" feature on this electric razor you could use for a couple of minutes of shave time. For those who are interested, this product measures 3 x 8.8 x 4.8 inches and weighs 13.8 ounces. 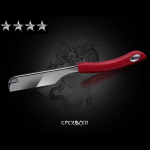 Over 3,350 people took the time to review this razor on Amazon, and the Remington PG6250 now has a solid 4-star rating. The company Hatteker makes the fourth best wet dry electric razor on our list. 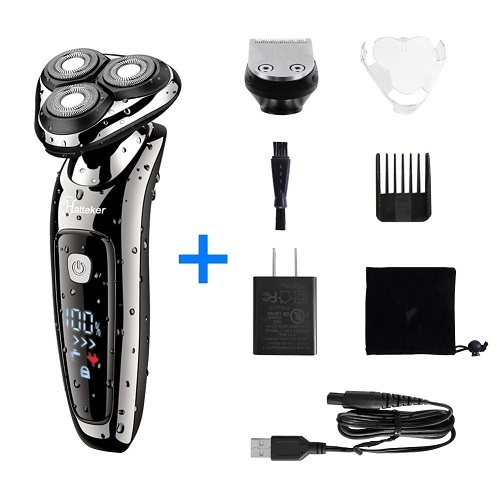 This black electric rotary razor is made with a unique double-blade technology. 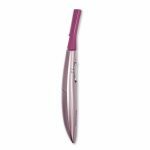 This allows the 3 head blades to naturally contour to your face. In addition to the shaving head, you'll also get a side-burn trimmer with this product. Each Hatteker Electric Shaver has an LCD. This screen tells you how long your lithium battery has left before it dies. For 90 minutes of charge time, you'll get 45 minutes of shaver usage. A few extra accessories you'll get with this device include a USB charging cord and a travel bag. 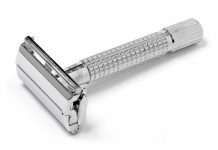 It costs approximately $36 for one of these razors on most websites. 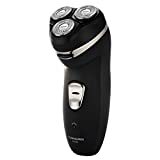 The average score for the Hatteker Men's Electric Shaver out of 300 reviews is a near perfect 4.5 stars. 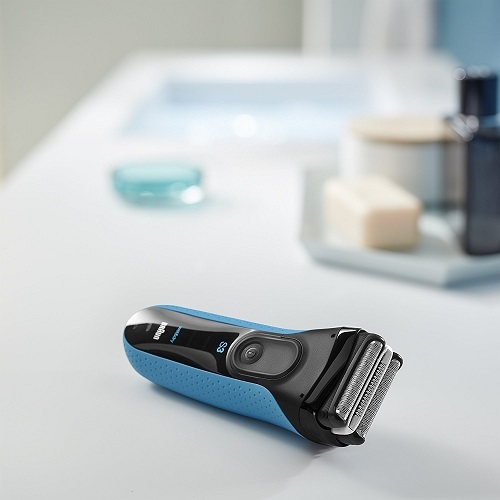 The best wet dry electric razor put out by the German company Braun is called the Series 3 ProSkin 3010s. 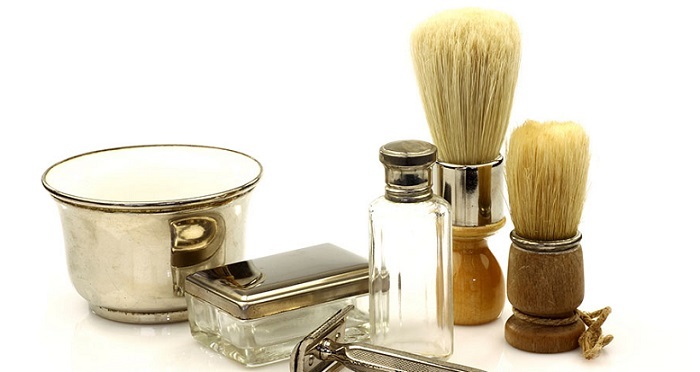 Every one of these shavers has 3 shaving elements that naturally contour to your face. Men with sensitive skin love the fact that these blades can detect pressure. The best part about them is that they will retract if they get too close to your skin. There's also a SensoFoil around the Braun Series 3's blades to further protect your skin. Instead of a lithium-ion battery, the manufacturers of the Braun Series 3 decided to use a NiMH battery. You can fully recharge this shaver in 60 minutes for 45 minutes of use. Men could also use the "Quick Charge" feature to charge their Braun Series 3 in 5 minutes for one shave. 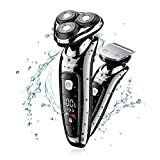 A major pro for this product is that it comes with a triple-action charging station that also cleans and lubricates your shaver. You'll also get a micro comb with this product to help you pick up more hair. This black and blue shaver measures 2.2 x 6.1 x 8.7 inches and weighs 11.8 ounces. 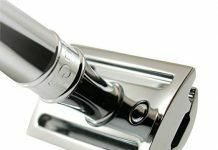 Out of over 1,500 reviews, the Braun Series 3 has a 4-star rating. The Braun Series 3 costs $51 online. 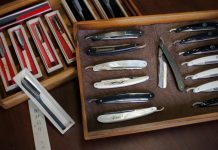 Even though the market received numerous ambitious producers, designs, and ideas, nobody can yet match Philips in terms of luxury shaves. 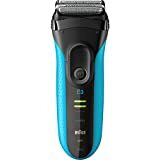 If you're looking to splurge on what many critics consider the best wet dry electric razor, check out the Philips Norelco Electric Shaver 8900. 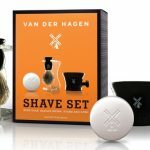 The great Dutch company is well known for its Norelco line of electric shavers. The 8900 model is one of their finest inventions. 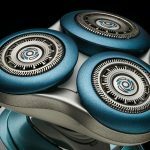 This extremely sleek blue and silver shaver has 3 heads that are able to shave in 8 directions. 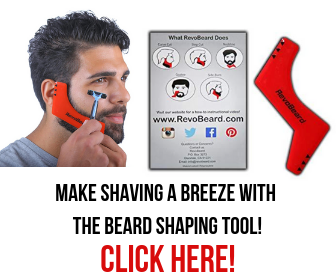 Users can easily change the length of their shave with a built-in beard styler equipped with 5 hair length options. The Philips 8900 has a lithium-ion battery that fully charges in one hour. The dimensions of this shaver are 3.3 x 6.1 x 9.1 inches, and it weighs just over 1 pound. There are over 930 customer reviews for the Philips 8900 online with an average score of 4 stars. Before you order this bad boy, just be prepared to fork around $140. 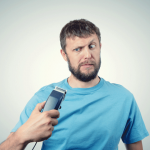 Checking whether an electric shaver is water resistant is a key feature to look for nowadays. As you can see from above, there are plenty of great wet/dry razors on the market for everyone's budget. 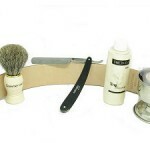 Hopefully, you were able to find the best wet dry razor for your shaving needs from the list above.